Cats are stubborn with definite ideas of their own. Training them to avoid your antique chair or to stay off the kitchen counter can seem like a near impossibility. But you don’t need to lock them up or remove precious items permanently. The solution is a combination of repelling cats from unsuitable areas and attracting them to a better space. It takes dedication and time, but if you keep at it, you can succeed. Whether you are trying to train your cat, discourage a neighbor’s pet, or dealing with feral animals, try these tricks to keep cats away naturally. Like people, all cats are different with their likes and dislikes. Pay close attention to undesirable behavior and try to determine the cause. Then choose the tip that will most likely help discourage the behavior. If it doesn’t work immediately, keep trying and possibly try a different tip. 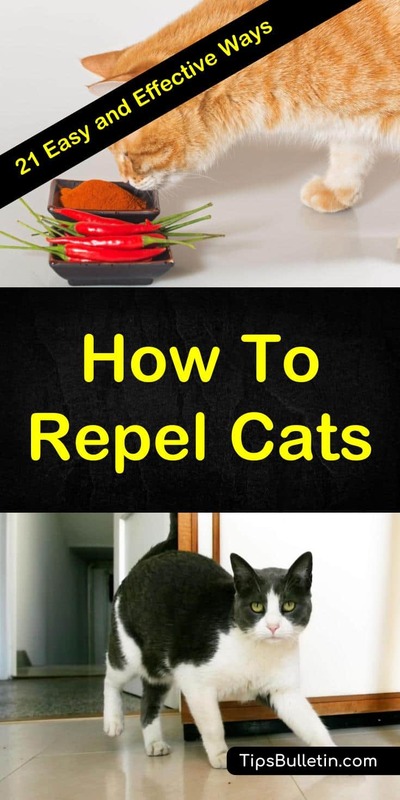 I hope these tips help you solve your cat problems permanently. Here are my top 18 tips on how to repel cats and train them to acceptable behavior. Like humans, cats are repelled by certain scents. To keep cats off furniture, countertops, and appliances, use cleaners with citrus, lemongrass, lavender, citronella, or vinegar. The scent will gently encourage cats to choose other places. Try one of our natural cat repellent spray recipes or use a diffuser with these oils in the area. If your cat likes to scratch on the arm of your new couch or wants to sleep in a forbidden spot, you can cover the area with a layer of aluminum foil. The texture of the foil and the annoying sound will usually persuade the cat to choose a different spot. A similar solution is to find fabric with an unusual texture and make an easily removable arm or seat back cover for the spot. Some cat owners use strips of masking tape in the area. By creating an undesirable texture you can encourage your cat to move. Your cat is going to choose a comfortable spot to lounge in, so if you don’t like the place she’s chosen, provide a better spot. Throw a soft, warm blanket in a box along with a little catnip; she may decide to make a move on her own. If stray cats are finding their way into your yard, they are probably finding food nearby. To keep cats out of your backyard, make sure your pet’s bowls are indoors and cover garbage cans securely. Cats don’t like water. If you are having a problem with cats in your yard, place motion-activated water sprinklers in the areas you’d like them to avoid or where they are entering the yard. Change the placements regularly, so cats can’t simply learn where they are and avoid the sprinklers. Before long, the cats will find another yard to visit. Some plants are natural cat repellents and can help you with a cat problem. The herb rue is particularly repellent and a good choice. Plant it in the spring for cat repelling properties all summer long. In the fall, dry the leaves and sprinkle them around the yard throughout the winter. Add cat repellents such as citrus peels, coffee grounds, or pipe tobacco to the mulch in your landscape. These natural repellents will keep cats away while nourishing your soil. Pay extra attention to areas around bird feeders and other areas that attract cats. If you do not have pets of your own, you can discourage strays from entering your yard using a sonic device. These devices emit high-pitched ultrasonic waves that are not detected by humans but are especially irritating to animals and pests. 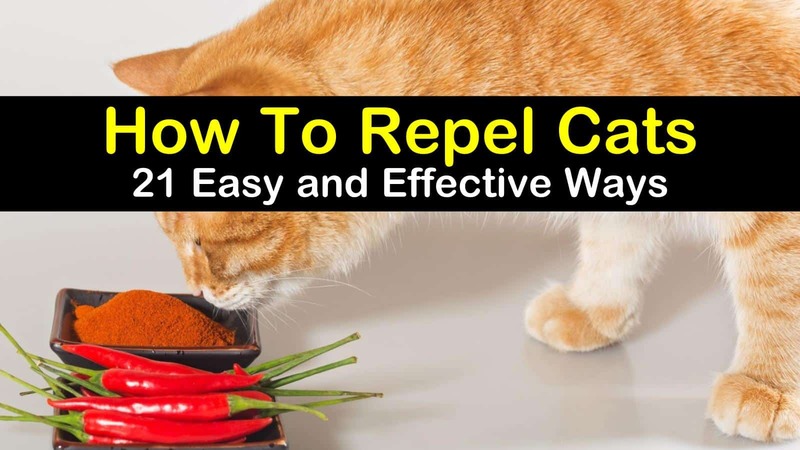 Commercial cat repellent sprays are made from the urine or waste of natural predators. Cats detect the presence of a predator, sense danger, and avoid the area. An occasional spray around the perimeter of the yard keeps cats away naturally. Cats are territorial and will continue to visit your yard as long as their scent remains. To be effective, your cat repellent plan should include removing their scent from the yard. Remove all feces from the yard and the top layer of soil. Spray the area with a cat repellent. If you have cats scratching and digging in your garden soil, you can lay chicken wire on top of the ground. The cat will not be able to scratch or dig. Mulch the area with stones or pebbles to discourage cats. They won’t enjoy digging in the rocks and will likely look for a more convenient litter box. Pinecones and other thorny materials deter cats from scratching and digging. A thin layer on top of your regular mulch is enough to do the job. These are uncomfortable to walk on and dig in, so cats are encouraged to move to another location. Sprinkle the perimeter of the yard, around trash cans, and other attractive areas with cayenne pepper or chili powder. Cats will be able to smell the pepper and avoid the area. Be careful when applying the pepper to prevent it from blowing into your eyes or the cat’s eyes. Consider dedicating a small section of your yard as a cat-friendly area. Provide a small area of dirt or sand for cats to scratch and clean it regularly. Attract cats away from other areas by planting plants that cats love, either for their smell or taste. Discourage feral cats from living in your yard by removing potential places of shelter. Securely close your shed and any crawl spaces under the house or porch..
Cats have different tastes and will sometimes eat houseplants or garden plants. In the garden, you can mix in rue or other plants that repel cats. Or try planting catnip in a remote area to attract the cats away from your garden. Indoors, the best approach is to train the cat to avoid the plant by spraying it with water when it approaches the plant. The ASPCA is promoting Trap-Neuter-Return to control feral cat populations. If the cats in your yard are feral cats, consider helping control the feral cat population by trapping the cats, neutering them, and releasing them. This may not keep them out of your yard, but it will help control the numbers over the long term. These natural repellents have strong scents that repel cats. A regular spritz with one of these sprays encourages cats to move on. Please do a small test spray in a hidden spot on fabrics or indoor surfaces to make sure they won’t stain. Mix in a two-ounce spray bottle and shake well before every use. Grind the citrus peels in a food processor or blender and mix ingredients thoroughly. Sprinkle in yard or garden to repel cats. Whirl fresh rosemary and water in a blender to release the oils or shake vigorously. I hope you found these twenty-one tips helpful. Learn how to keep stray cats away and how to repel cats outdoors or inside and change the cat’s behavior. Half the battle is in knowing the cat and their likes and dislikes. The suggestions listed here, or a variation, should work for all cats. What is your favorite way to keep cats out of your yard? Let us know in the comments. If you try these tips, please let us know how they worked for you. We can all learn from each other. Please help us by telling others about these tips on social media or pin it to share later.